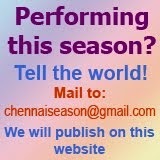 4.00 p.m. - S. Jayakumar (Vocal), K.P. Nandini (Violin), K. Parthasarathy (Mridangam). 10.00 a.m. - Prof.S.R.Janakiraman – “The significance of the different Sections in different Musical Compositions” Lec-dem With Vittal Ramamurthy & Umayalpuram Mali. 10.00 a.m. - R.K.Shriramkumar- “Jananat Kamalalaye…..A Musical Pilgrimage to Tiruvarur with Sri Muttusvami Dikshitar” With Amritha Murali & K.ArunPrakash. 10.00 a.m. - Dr. Varalakshmi Anandkumar - “The Deities and Devotional aspects in Tiruppugazh Hymns”. Episode-1 With P. Naveen Kumar & J. Vaidhyanathan. Programme supported by The Ministry of Culture, Government of India. 10.00 a.m. - Dr.Sumathi Krishnan “The Royal & Court Composers-the Changing Face of South Indian Music” With Dr. Rukmini Kannan- Veena & Arjun Ganesh. 4.00 p.m. - Vidya Kalyanaraman (Vocal), Delhi Sridhar (Violin), Rajna Swaminathan (Mridangam), S. Krishna (Ghatam). 10.00 a.m. - Hyderabad Brothers D.Raghavachari and D.Seshachari - Manodharma Sangeetham: “Swara Kalpana”. 10.00 a.m. - Dr. ’Ghatam’ Karthick’s “Heartbeat Ensemble” presents 'Shivalayam' - Arudra Dharisanam Special Concert. 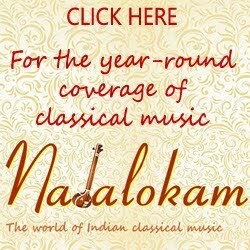 4.00 p.m. - Lakshmi Krishnakumar (Vocal), Melakkaveri Thyagarajan (Violin), Kumbakonam Ramakrishnan (Mridangam). 6.45 p.m. - Rudrapatnam Brothers R.N. Thyagarajan & R.N. Tharanathan (Vocal), R.K. Shriramkumar (Violin), Trichur Narendran (Mridangam), Anirudh Athreya (Kanjira).